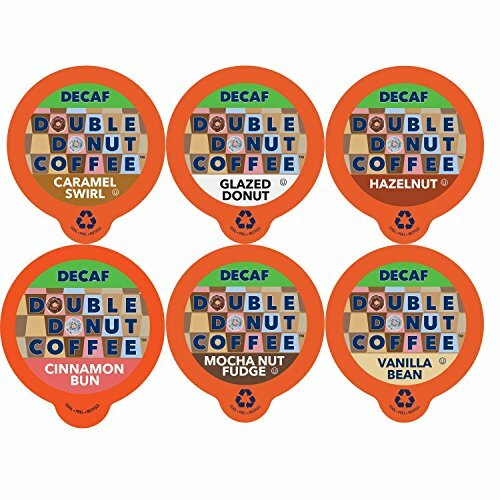 This great Decaf Flavored Coffee Variety Pack from Double Donut Coffee contains 6 flavors: Caramel Swirl, Mocha Nut Fudge, Cinnamon Bun, Vanilla Bean, Hazelnut and Glazed Donut. Better Choice: Double Donut capsules are Recyclable perfect for use with both the 1.0 and 2.0 Keurig K-Cup brewer. Please help stop the proliferation of non-recyclable capsules. Made with high-quality Arabica beans for true, rich flavor. Double Donut Coffee has no affiliation with Keurig or K-Cup. Keurig and K-Cup are registered trademarks of Keurig and Green Mountain.